Price Action – Lagging or Leading? I understand completely what they’re saying; they’re essentially correct; although I have some concern over the use of the term lagging. Price action analysis is not about the past… but about the future. While it’s true that previous price bars show what occurred in the past, the current price bar shows what is happening right now. Our focus is not in the past but instead in the present and the future. Situational awareness involves three components… perception of environment (what’s happening), understanding the meaning (what does that mean), and projecting forward in time (how will that impact me in future). We aim to maintain situational awareness within the markets via (a) conducting analysis of the current price action (what’s happening), (b) considering the current action within the context of previous action, and identifying signs of strength and/or weakness (what does that mean), and (c) projecting that forward to identify areas where other traders may be exposed to stress and forced to act, thereby creating orderflow required for profit (how that will impact the future). Essentially, we’re creating IF-THEN statements about future possibilities, then carrying out the appropriate actions based on whichever scenario develops. IF however price breaks above resistance, THEN I’ll reassess my expectations of the future, aiming to possibly search for a pullback entry long. In this way, we are not trading via lagging indicators. We are identifying potential opportunity in future price action; and then trading this opportunity only when price action conforms to our future expectations (as time advances). This is not a lagging, reactive strategy. Rather, it’s forward looking and proactive. Have a read of the following article, for another explanation of this concept through an aviation analogy: http://yourtradingcoach.com/trading-process-and-strategy/stay-ahead-of-the-aircraft/. Effective navigation and mission management must be forward looking. 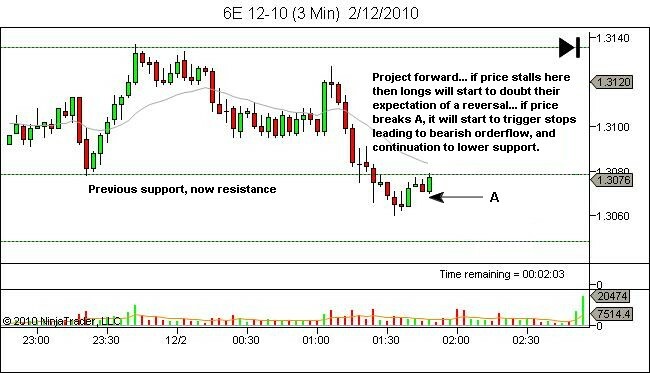 Effective price action analysis must also be forward looking.